A woman who swept down a steep ravine after being caught in an avalanche while skiing in the US was saved by a man who'd filmed the drama on his mobile phone. Witnesses said the woman was left buried in snow and only survived because other skiers dug her out quickly after she deployed a special airbag. Joe Campanelli's mobile phone video footage shows the woman skiing into a gully filled with loose snow near the Alta ski area in Utah. He can be heard to say: "That is not a good slope to ski," before adding "you're in a slide, bud", when the snow started breaking up and turning into an avalanche. The skier pulled a ripcord on her European-style airbag-equipped backpack and was swept around 100ft down the gully. Mr Campanelli stopped filming and he and friend, Aaron Rice, went to help the stricken skier. Mr Rice said he'd used an avalanche beacon and probe to pinpoint the woman's location under the snow before he and a group of other skiers dug her out from beneath several feet of snow. He said: "She was breathing, talking. She said, 'Thank you. I can't believe you got here so quickly'. She was completely shaken up." Officials said although the woman's air bag had little time to work as her descent into the ravine was so steep, it may have prevented her from getting buried under even deeper snow. 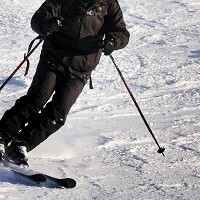 The incident highlights the importance of skiers having a good sports travel insurance policy to ensure they're covered in the event of unforeseen circumstances. Bruce Tremper, director of the Utah Avalanche Centre, said the woman was lucky to be alive and to have come through her ordeal uninjured. He said the state had an average of four fatalities caused by avalanches each year, adding: "It's a game of Russian roulette. People may perceive a slope to be safe, but there are booby traps all around."